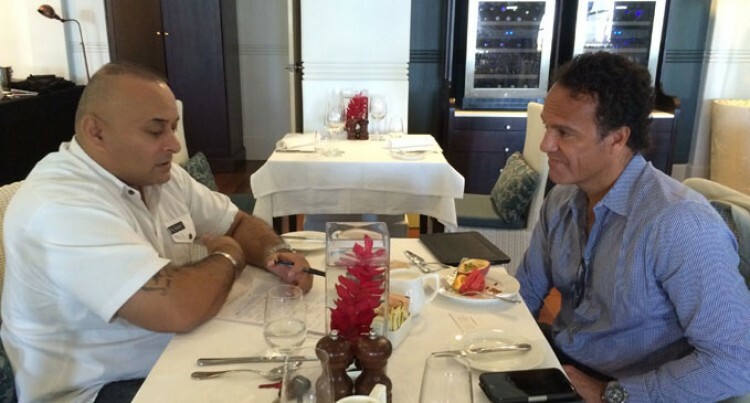 Ajay Bhai Amrit (left), with Rob Cromb. Rob Cromb is a true son of Fiji, born in Bua and spending the best years of his life as a child in his village in Solevu, Bua in Vanua Levu where life is as good as it gets. He did not have a care in the world as the love he received from his peers was more than enough to compensate for any need for material goods. At the age of 12 this was all to change because his mother decided to move to Melbourne, Australia, to seek greener pastures. Being born to a iTaukei mother and a Australian father made the transition very tough for him as the colour of his skin initially led him to be ostracised . This was all to change as he excelled in sports and became popular as an all- round athlete. Competing in athletics, swimming and playing water polo at state level, he was also an accomplished AFL player. In fact Rob was good enough to represent South Melbourne in AFL. After graduating from high school and starting university something was still missing and Rob returned to his beloved village in Bua at the age of 20 for almost one year. It was during this time that he became extremely close to his grandmother who was a chief in the local area and had responsibilities to look after her people. In fact Rob would go as far as to name his grandmother as his greatest hero and a person who had a priceless gift of showing unconditional love, not only to him, but to everyone she encountered. After his stay in the village Rob returned to Australia focused, and was ready to climb the ladder of the corporate world. After spending time working as an investment analyst and stock broker Rob’s entrepreneur skills led him to try and branch out on his own and after a few rocky moments and risks the famous brand KOOKAI was born. At first it was a wholesale business dealing in high end women’s apparel and when it was getting difficult to continue in this market Rob decided to open his own store to sell his goods. At first it was a single store in Chapel Street in Melbourne which did amazingly well as his clothing line was an instant hit with the customers. This led to opening other high-end stores and today KOOKAI is one of Australia’s most successful and iconic fashion brands. This success also led to a change in strategic thinking and within a short space of time Rob decided to open up his own manufacturing operation in his beloved Fiji. Firstly, on a small scale and today he is very proud to say he employs almost 1000 Fijians at his facility which encompasses three sites. His head office is based in Melbourne and retail shops now span across Victoria, New South Wales, Queensland, Western Australia, South Australia and New Zealand, with almost 40 retail stores spread across these regions. So what now for such a highly successful entrepreneur? Well in the future Rob wants to bring more employment to Fiji and is targeting a work force of around 2000 people, in addition to this he would like to see his retail shops cross the 50 mark, which will be a huge achievement and great news for the people of Fiji. During my interview with Rob it must be said I discovered that he was a very hardworking man and humble by nature. A man, who has rediscovered his soul and is passionate about the people of Fiji, he is helping them not through words but by his actions. Finally, I left this interview feeling very positive that regardless of the fame and fortune Rob Cromb has earned, he is still very much a village boy at heart.